For decades, Western Costume employed a “make to rent” policy, meaning a designer could order a custom-made costume for their film, but after filming was complete, it came back to Western and was incorporated into the rental stock. This system was mutually beneficial: designers got the fabric, cut, and fit that they wanted; the studios spent less than they normally would on a custom piece; and Western was able to build their stock. Typical Western Costume Label from the late ’30s. 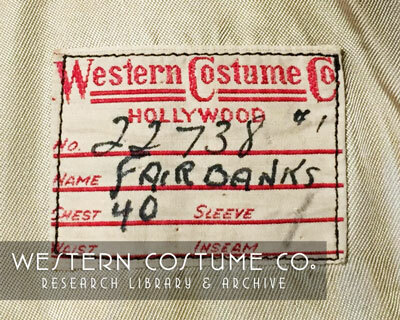 Because so much of Western’s stock was historically made in-house, many of our pieces contain a Western Costume label with an actor’s name and an invoice number. These days, when a label is discovered in stock with a recognizable name, it is sent to our costume archive, known as the “Star Collection.” Unfortunately, the invoices to which the invoice numbers correspond were thrown away long ago, so determining what film a costume was worn in requires some serious sleuthing. Clues like the style of the label and whether the name is hand-written or typed help narrow the time period when something was made. Other indicators, like the period and fabric, help us further limit the possibilities. From there, it is a matter of looking at film stills, publicity shots, and film clips. 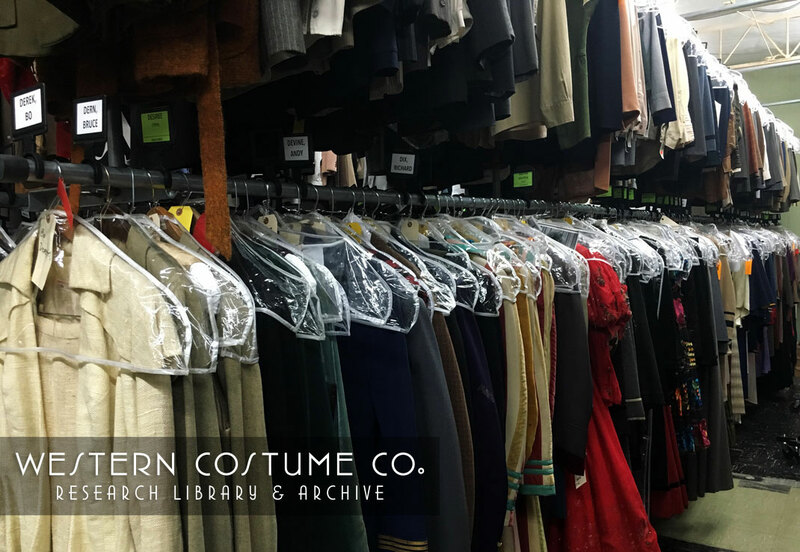 Our collection manager, Beth Grover, has overseen the reorganization effort for the past year and a half; since then, she and her assistant, Erin Fabian, have managed to identify the films in which nearly 3000 pieces in our archive were worn. Closeup of the lapels of Christopher Plummer’s tailcoat. 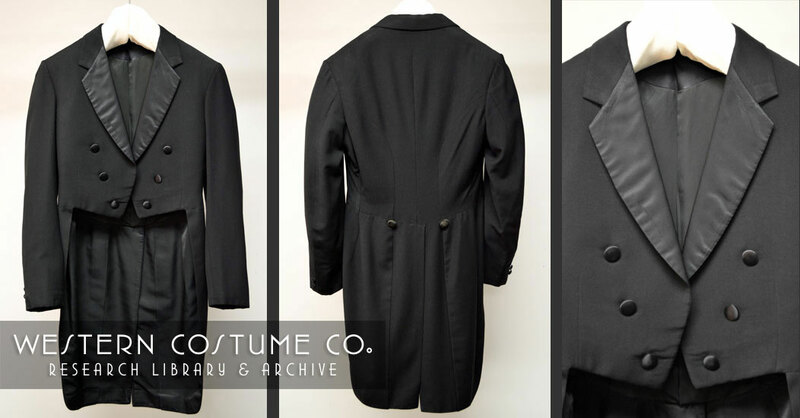 Erin found a peaked lapel tailcoat hanging under Christopher Plummer’s name in the archive. She first checked to see if it might be his tailcoat from The Sound of Music, but that coat had a notched lapel. Unable to determine what else it could be from, she compared the invoice number on the tag to other pieces in our collection from The Sound of Music; the numbers were very close. Erin, Beth, and I took another look at the lapel and felt a slight break in the fabric at the base of the peak under the satin. We were convinced that it had been converted from a notch to a peak, and Beth carefully opened the seams (shown on the left lapel in the photo on the left). 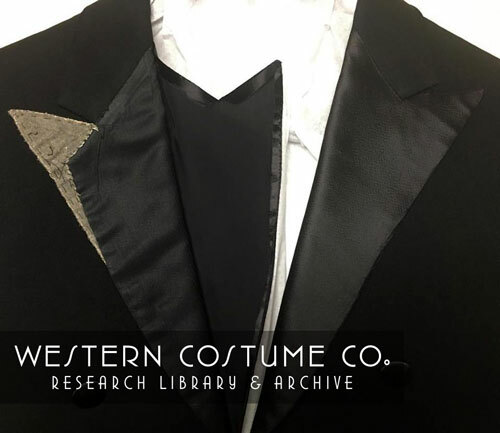 Sure enough, hiding beneath the outer layer of satin was a notched lapel that matched the tailcoat he wore in The Sound of Music! The alteration was so beautifully executed, we almost didn’t catch it. Tailcoat worn by Christopher Plummer as Captain von Trapp in The Sound of Music. Costume designed by Dorothy Jeakins. Photos by Western Costume Co.. Multiples of a coat worn by Douglas Fairbanks, Jr., in Gunga Din. Costume designed by Edward Stevenson. Photos by Western Costume Co. These two red coats that Douglas Fairbanks, Jr., wore in Gunga Din are another great example of how difficult the identification process can be. 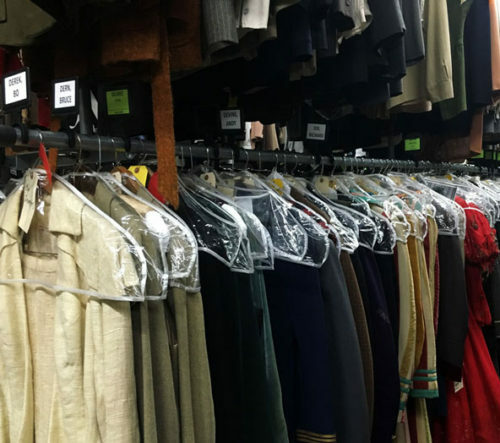 As with all of the costumes at Western, these coats were worn on film, then went back into stock to be rented by subsequent productions. As a result, each jacket has been altered and re-altered many times over the past 70 or so years, leaving them in a very different state than they were when Fairbanks wore them in 1939. And although they were initially identical multiples of the same coat, they now look quite different from one another, as you can see in the photos above. The cuffs of both coats have been replaced, some trim has been removed, and other trim has been added. One of the coats has an entirely different back detail than it had originally. Occasionally, by identifying the film an item was worn in, we are able to reunite pieces from a single costume. 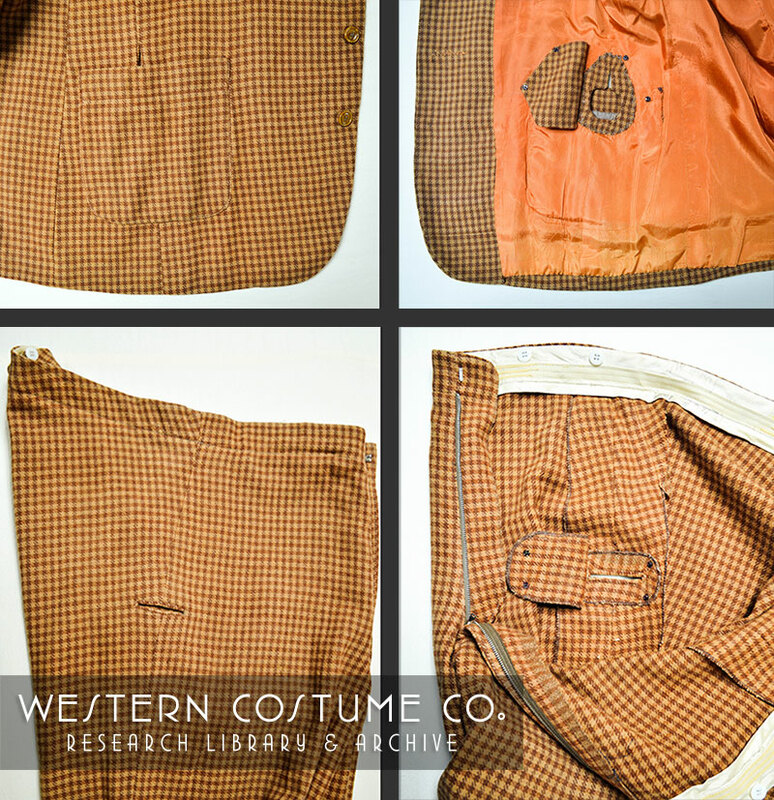 Men’s pants comprise a good portion of our archive, so we are thrilled any time we are able to match them up with the corresponding jacket or top, which is usually more recognizable as tops tend to get more screen time. With a pair of black slacks or khakis, identifying the film and mating them to their top can nearly impossible, but with a more unusual fabric or style, it can be a little easier. 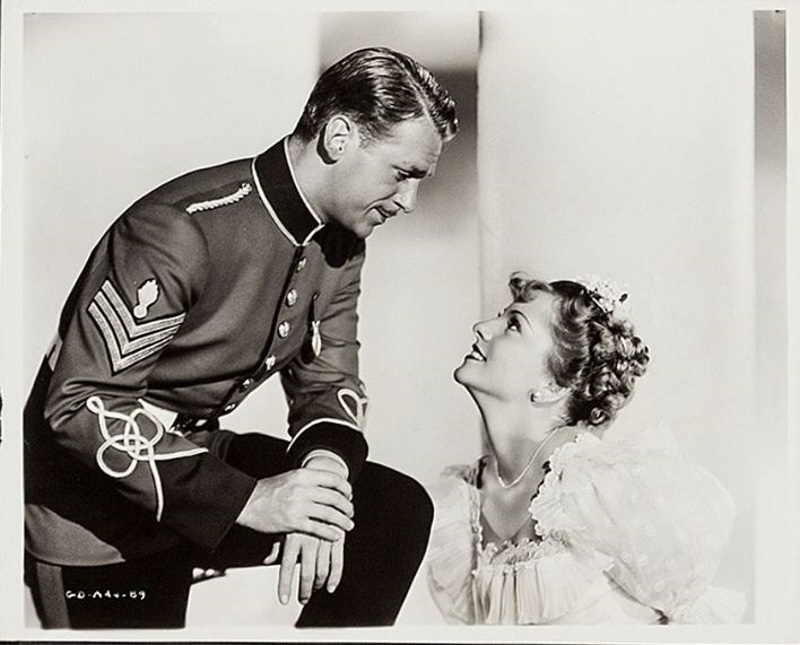 One of the first outfits that Beth reunited was a skirt suit that Cary Grant wore in I Was a Male War Bride, but in that case both pieces were already in the archive. 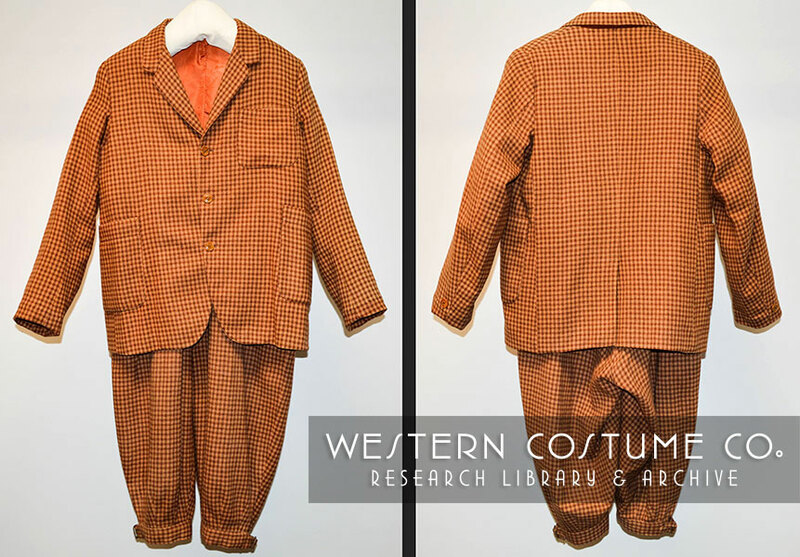 More recently, we had a pair of Ed Wynn’s gold and brown, checked plaid knickers that Erin identified as being part of the suit he wore as Uncle Albert in Mary Poppins. The matching Norfolk jacket was nowhere to be found in our archive. Costumers and designers still occasionally find pieces in our rental stock that belong in the archive, either because they haven’t been rented in the past couple of decades, the label has been hidden in the seam of an alteration or removed entirely, or because they were worn by a lesser known actor. Erin and I decided to take a look in stock for the Norfolk jacket since the pattern of the fabric was so unusual. One pass down the 1910s/1920s aisle produced not only the matching coat, but also a double of the entire outfit! Suit worn by Ed Wynn as Uncle Albert in Mary Poppins. Costume designed by Tony Walton. Photos by Western Costume Co. If the Ed Wynn labels and photo confirmation weren’t enough to confirm they were from Mary Poppins, the construction provided further proof. With its groundbreaking visual effects, Mary Poppins raised the bar of what “movie magic” could mean. In Uncle Albert’s “I Love to Laugh” scene, the characters (along with a table and tea set) float to the ceiling and have tea in mid-air. Consequently, Wynn’s costume had to accommodate a harness and wires. Looking at his costume, I was struck by the cleverness and detail of the engineering; two wire holes, for example, are hidden behind patch pockets on the front of the jacket. Any modern costumer or sewer can appreciate the quality of the construction: each opening is faced and has a lined flap on the inside that snaps closed. Wynn’s suit had to accommodate a harness and wires so he could “float” up to the ceiling. Photos by Western Costume Co..
As of this week, we have begun cataloging our collection into a database. With roughly 6000 pieces to enter, the process will take some time. Check back for stories of other interesting discoveries as we go back through the archive and photograph each piece. I recently acquired a pair of men’s slacks (double knit? perhaps 1960s vintage) with your label in the waistband, No. 2966-4, for Robert Lansing, 35×31, and a Western Costume bar code label #40181622. Might you be able to tell me what show these trousers were used in? Please let me know if I can help you with further information. Thank you!